1. Heat 1/4 cup of the olive oil in a large saucepan. When it is hot, add onions and saute for a minute, add tomato and fennel. Stir the vegetables into the oil with a wooden spoon, add Pernod and flambe liquor. Then add another 1/4 cup of olive oil, garlic, orange zest, thyme and bay leaf. Cook until the onion is soft and golden but not brown. 2. Add white wine and reduce by half. Cut fish fillets into 2-inch pieces. Add pieces of fish, clam juice and cooked fingerling potatos to the vegatable mixture. Bring to a boil, then reduce heat and simmer, uncovered, for about 10 minutes. Add clams and shrimp. 3. Add saffron, check seasoning and add salt and pepper if desired. Bring to a simmer again and cook about 5 minutes longer. 4. For croutes and rouille: Mix all ingredients together in mixer. Taste and adjust seasoning if needed. Spread rouille on toasted bread. 5. At serving time, place a thick slice of toasted crusty French bread in each bowl. 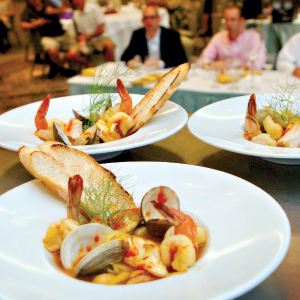 Spoon the bouillabaisse over the bread.